A private group medical practice in Wisconsin and one of the largest in the United States. The Marshfield Clinic Health System encompasses several entities spanning insurance, medical research, laboratory testing, and information systems. I spent 3+ years of my career with the talented members of the Marketing and Communications department. I participated in many projects along the way. Here are a few notable case studies to share. One of the primary site goals is to easily find a doctor. A dedicated landing page for doctors is the gateway to this task. Site traffic showed significant drop off and site exits from this page. Our challenge was to redesign the doctor searching experience and make it easy to find, filter and make an appointment with a Clinic provider. Using our analytics tools, we analyzed what was happening on the landing page. Several things became clear. Site visitors tried to search by first name, last name or location most often. Spelling errors were common, especially for providers with unique last names. Incomplete terms were searched as well (typically 5 characters or less). Incorporated type-ahead functionality in the search field which offered suggested terms based on the first three letters typed. Added a browse box where users could casually search by a letter to begin their journey. This alphabetical browse feature now accounts for approx. 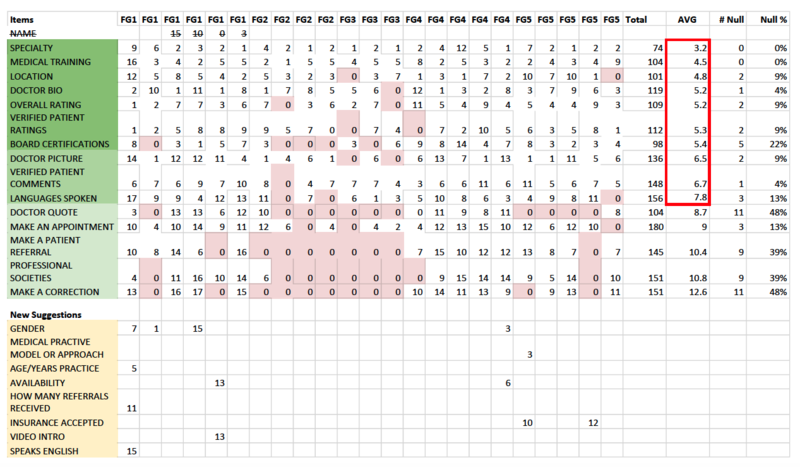 1/3 of initial doctor searches since it’s launch. Moved the search box to align with the common F-Shaped reading pattern typically seen on many websites. 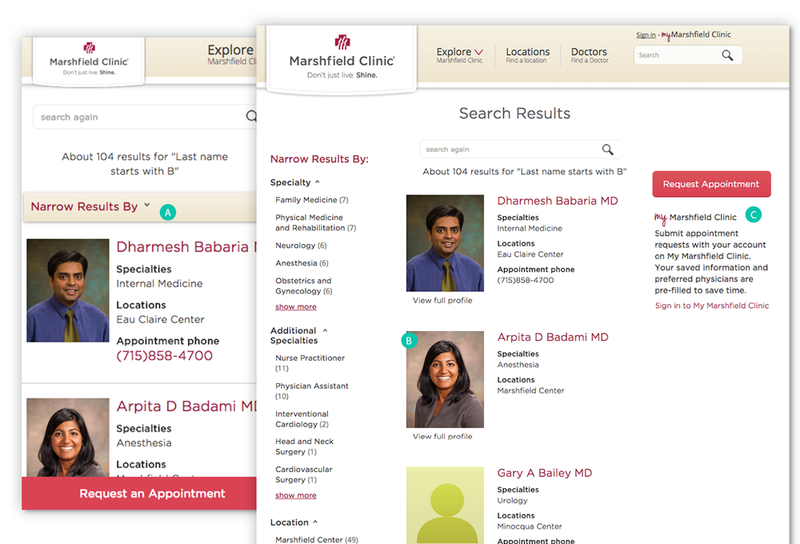 Also visually separates the universal site search from the doctor-specific one. (A) On mobile devices, filtering options pushed the main content down below the screen. Naming conventions and CSS changes were applied to give filters a sense of hierarchy. We deployed a collapsable menu at screen sizes below 480px wide. This menu was visible if needed but closed by default. (B) Click-map data showed that users would often try to click on the photo of a provider, but this would not take them to the profile page. Our redesign included this ability as a way to encourage views on the page. (C) One of the underutilized features was the “My Favorites” section. Although, we did not do any primary research as to why this might be, a national ongoing poll about how people search for doctors suggested that there are numerous factors that affect this decision including: location, reference from a friend, health insurance acceptance, and office staff friendliness. Forming an opinion based on online and offline interaction would be more important than a side-by-side comparison in our product offering. The business wanted to maximize opportunities to request appointments. The favorites feature was removed and replaced by more actionable content that would be useful to both new and existing patients. It’s evident to me that the search has been enhanced, search volumes are increasing without an increase in null results and mobile users are finding the collapsible filters useful. As Marshfield Clinic celebrated its 100th birthday, behind the scenes changes in how the business operated were being put into place to ensure that the clinic will be around for many more years. 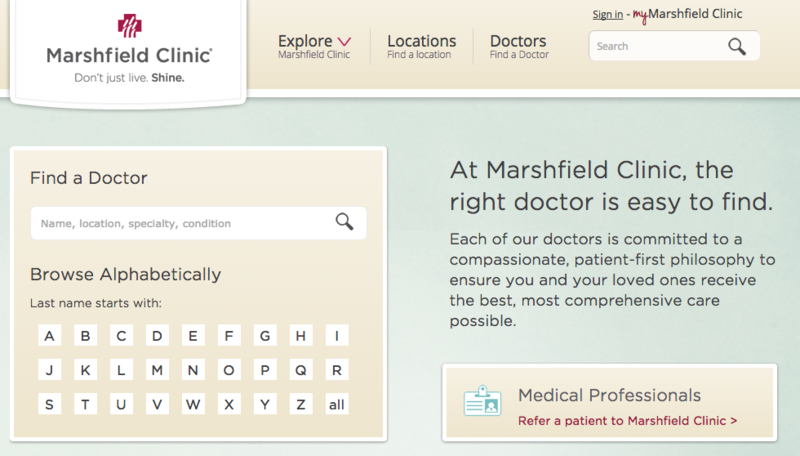 Traditionally, Marshfield Clinic had made decisions with the doctors best interests in mind. However, increased market competition and changes in how people consume healthcare led towards a more consumer focused business model and a UX opportunity that had never been permitted in previous requests to leadership. Show what patients really think about their doctors on the website. Thus, the provider transparency initiative was green lighted. There was a lot of anxiety within the organization about the implications of showing doctor ratings online. We needed to prove that patients would like this functionality and that it would improve the reputations of the doctors there. This project offered a lot of collaboration and access to patients for our decision making process. The clinic was already sending out surveys to patients after doctor visits through patient experience partner Pres Ganey. Marshfield Clinic regularly conducts patient advisory panels and I advocated strongly that we attend one of these sessions to get a feel for perceptions of doctor ratings first hand. What (survey) categories are most important to you when choosing a doctor? 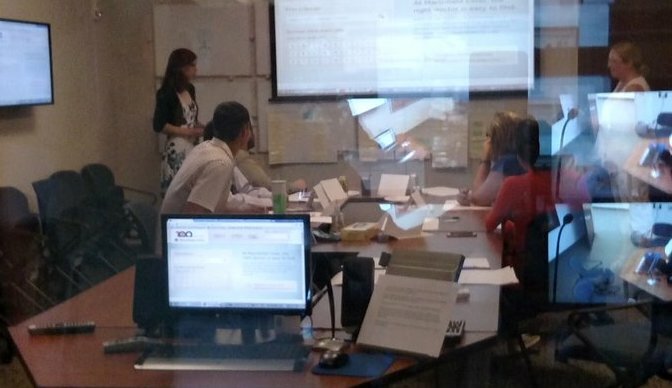 View from behind the one-way glass observation room during usability and feedback sessions. 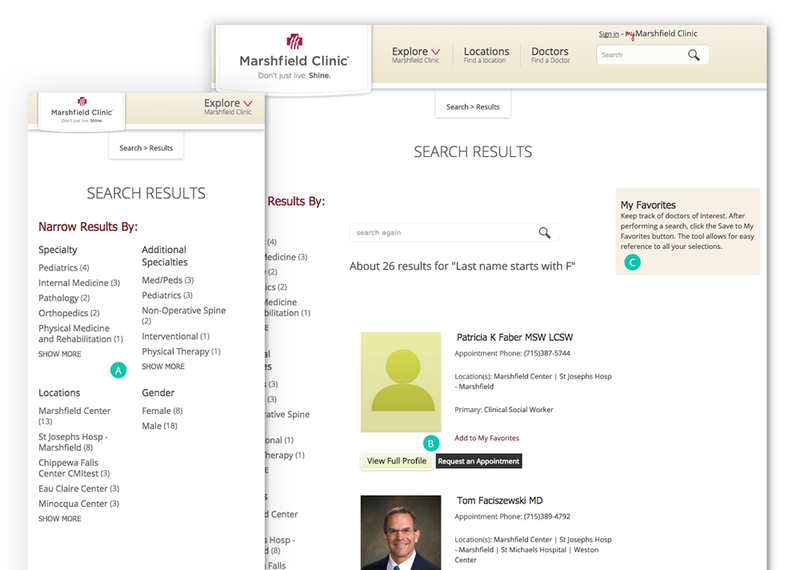 The sessions were composed of 3 main parts; a task analysis on search directories, competitor websites as well as the current Marshfield Clinic site. The next task was a card sorting exercise where participants were asked to order chunks of content in the order of importance that they might see on a doctor’s profile. The image above shows a ranked summary of the findings of this task. The most important information had a lower average score. 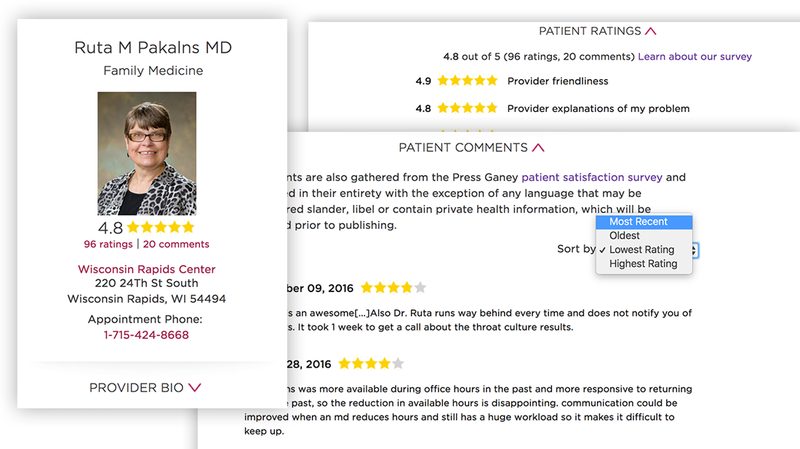 Both provider ratings and comments from patients were in the top rankings. Also shown are new suggestions for future development road-mapping. The last study we conducted in each usability sessions was more visual design focused on preference and usability. Three different concepts of doctor profiles were presented to participants. They were asked about which design were easy to understand and most helpful to them. Certain controls such as toggles were also prompted to get a sense of whether these features would be easily understood. 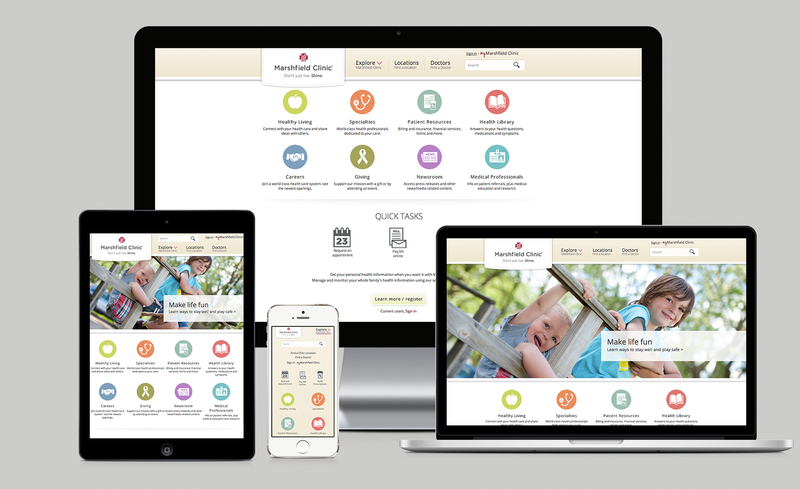 Provider ratings first appeared in September 2016 and has been recognised as a positive influence for patients and has also won an American Web Design Award. See the final design of the doctor profiles here.